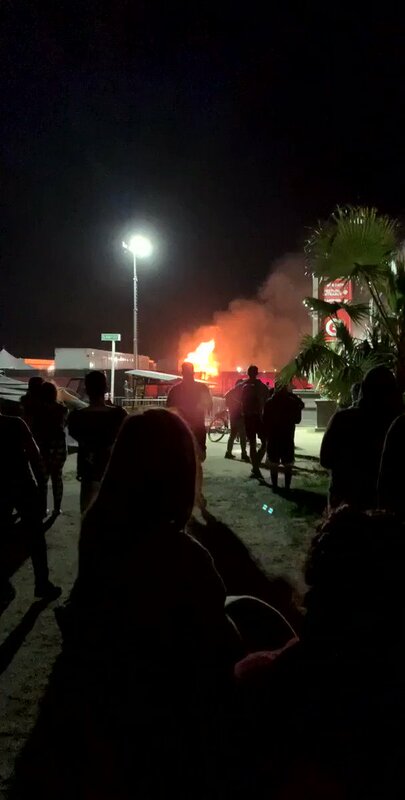 A fire has broken out at Coachella music festival in California, with footage showing the blaze tearing through a shower block. Attendees shared films on social media of the fire, which took place at the festival’s campsite in the early hours of Saturday. But the fire caused panic, with footage posted online showing a man urging festivalgoers to “back up, back up” as the mobile shower unit stood ablaze behind him. One camper claimed to have heard “explosion sounds” and said one person fled the fire with their towel. Headliners at Coachella, which runs over two weekends, include Tame Impala and Ariana Grande. The actor Idris Elba is also performing a DJ set. Other artists include the British rock band The 1975, Jaden Smith and the Grammy award-winning country music singer Kacey Musgraves. The festival takes place in a desert valley in the southern Californian city of Indio, 127 miles (204km) east of Los Angeles.